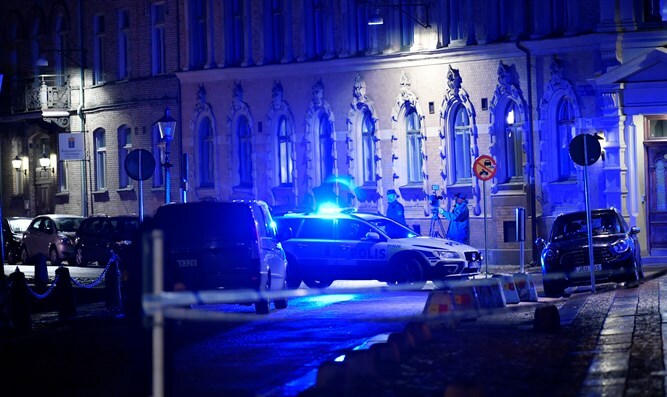 Swedish police extend arrests of two suspects in firebomb attack on a synagogue in Gothenburg. The Swedish police on Wednesday extended the arrests of two of the three suspects who were arrested in connection with Saturday’s firebomb attack on a synagogue in Gothenburg, Israel’s Channel 10 News reported. The police say at least ten people took part in the attack, but it is not clear at this stage whether there will be further arrests. The suspects whose arrests were extended are a 21-year-old Palestinian Arab who arrived in Sweden in 2014 and an 18-year-old Syrian who has been in the country since 2015, according to Channel 10 News. Both suspects have temporary visas and work permits and both deny the charges against them. The firebomb attack took place as Jewish students were holding a party inside the synagogue. A fire had broken out between parked vehicles outside the synagogue but there were no injuries. The Swedish prosecution alleges that the motive for the attack is the Israeli-Palestinian conflict. "Our theory is that there is a connection to the conflict, given the target and what we know about the suspects," said a source in the prosecution quoted by Channel 10 News. On Monday, two burning objects were thrown at a chapel located at a Jewish cemetery in the Swedish city of Malmo. Police in the city said they discovered traces of a flammable fluid near the cemetery that they suspect had been targeted by arsonists. Swedish Prime Minister Stefan Lofven condemned the attack in Gothenburg and denounced anti-Semitism. “I am outraged by the attack on the synagogue in Gothenburg yesterday and that violence against Jews was incited at a demonstration in Malmö. There is no place for anti-Semitism in Swedish society. The perpetrators must be held to account. All democratic forces must now work together to build a tolerant and open society in which everyone feels safe,” he said.